Make no mistake, you know what you're in for as soon as you walk in and are confronted by one of the most iconic and infamous images from the history books--the cargo plan of the slave ship Brookes, writ large through a combination of needlepoint and blackened wood clothes pins. The nod to domestic arts is a subtle reminder that enslaved people did not just toil in the fields, they made the house a home for their oppressors. Rendering the bodies in three dimensions gives them an individuality and presence that transcends the limits of flat representation, a trend throughout this mostly sculptural show that makes the pain of whitewashed history and current events palpable. Not all the work is political (there are deft and lyrical fabric abstractions upstairs), but most of the pieces aim to shine a light on issues most people would rather ignore. For what can explain the persistence of these injustices other than conscious denial? Esther Ervin's masterfully crafted art seeks to provoke and disrupt complacency with the status quo. Fundamentals of Imprisonment dissects a basic entomology text book, sliced open precisely, the word fragments "class" and "derm" isolated in no way by accident. 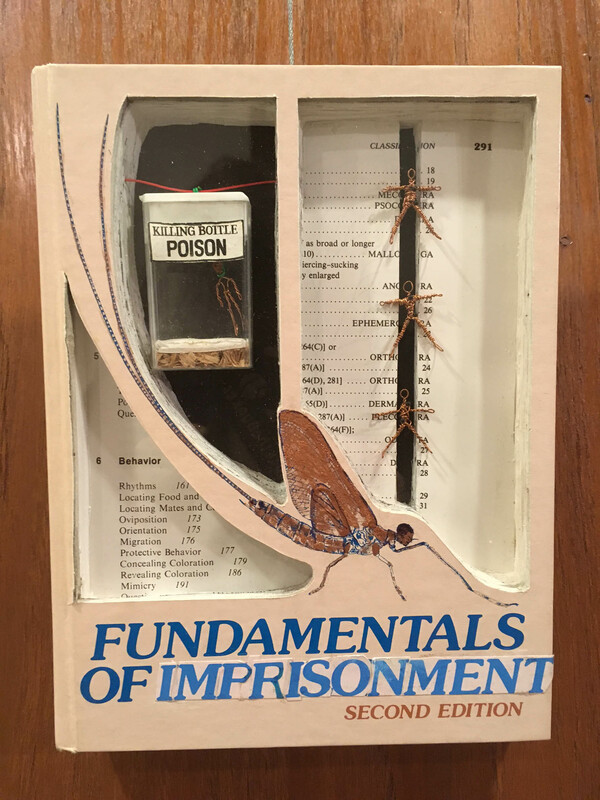 Within the gutted pages, three exquisite wound copper wire figues, each about an inch tall, are pinned like butterflies, with a fourth hanging by its neck in a Tic Tac box repurposed as killing bottle/gas chamber. The wall text pulls no punches. 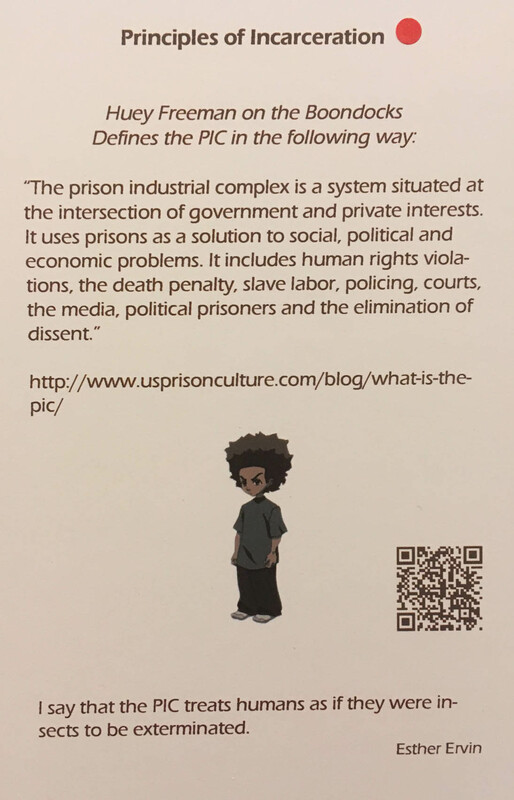 School to Prison Pipeline is a diabolical diorama, an exhibit from an imaginary Museum of Unnatural History. At first glance it might seem overly literal--there's a school, a pipe, and a prison--but there are fine details: chess pawns for prisoners, empty chairs in the school (one overturned), a shelf of very specific miniaturized books that serves as a reading list to learn more on the topic, and meticulous minute elements of its construction that draw one closer to the tiny cells, instilling a feeling of confinement and claustrophobia. It's a concrete visualization of a complicated subject, assembled with care and attention that speak to the artist's devotion in creating these unsettling worlds. Some might object to didactic art, but more education is needed. This was brought home to me at a #NODAPL gathering where a millenial with her heart in the right place asked me what coup meant. Vocabulary is important, which is why much of Orwell's 1984 is concerned with the cooptation and reduction of language. So I welcome shows like this that identify and illustrate key concepts such as hegemony, oligarchy, and republic, using impressionistic means that blend politics and aesthetics in a beguiling mix volatile as a Molotov. Esther Ervin's work, while in some ways explicit, is also metaphorical and mysterious. It invites contemplation, interpretation, and ultimately conversation. In a statement at her website, she acknowledges the importance of the viewer's subjective experience of her artifacts: "I hope you will appreciate them in your own way." Propagandists assert their truths as absolute, artists interrogate. Esther Ervin's keen eye and exacting techniques manifest complex issues in ways that don't offer the last word but rather serve as starting points for further exploration and dialogue. Go see the show and decide for yourself.